Dental implants are used in the case of missing teeth. Missing teeth can be caused by the tooth falling out due to decay, injury or gum disease. Dental implants act as a replacement root for the tooth. They help to provide strength and support for replacement teeth. Dental implants are made to look like your own teeth and even feel like them in order to eliminate discomfort. They are designed to be fused with bone which makes them permanent. 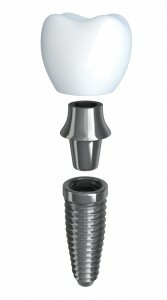 Dental implants provide improved comfort, speech, appearance, oral health, eating and self-esteem. Dental implants are generally not covered by dental insurance. Some coverage may be possible due to the cause of injury or tooth loss. Detailed answers about your personal needs for dental implants should be discussed with your dentist and insurance provider. The cost for dental implants depends on the scope of work to be done and the credentials of the dentist. Patients who have healthy gums and enough bones to hold the implant are good candidates for the procedure. Heavy smokers, those suffering from diabetes and those who have undergone radiation should be evaluated on an individual basis. If you have met the criteria to get dental implants you will meet with the dentist to create an individualized treatment plan. The plan will address your needs and desired results. The dentist will then create a plan based on the implant option that is best for you. The tooth root implant is placed where the missing tooth was, directly into the socket of the bone. The jawbone heals around the implanted metal post. Once the implant has been properly secured to the jawbone, an abutment is attached. The dentist will make impressions of your teeth and a model of your bite in order to develop the implants. The replacement tooth which is called a crown is then attached to the abutment. Some people will choose to have attachments placed directly on the implant. The dentist will match the color of the new teeth to your natural teeth. The replacement teeth will look, function and feel just like you own teeth. There is very little pain associated with dental implants. Commonly local anesthesia is used during the procedure. Although every person is different, the healing process usually takes around six to twelve weeks. The dentist will give you after-care advice to ensure that there are no problems with the dental implant. The most difficult time of recovery is after you receive the root implant. It can last anywhere from six to twelve weeks. During this time your mouth may be a bit sensitive and precautions should be taken when brushing and flossing in that area. After you have received your implant there is very little pain because it will feel just like your own teeth. If you do experience any discomfort Motrin or Advil can be taken. Dental implants require the same oral care as real teeth. It is important to brush, floss and rinse to prevent cavities and gum disease. Your dentist may want to see you a few weeks after you have received your dental implant to ensure that your bite is correct. The dentist will also want to know if you have been experiencing any discomfort in your mouth. If you do experience major discomfort or feel as though your implant may be loose contact your dentist to schedule an appointment. Dental implants can last a lifetime if treated with proper oral habits.